Our Lady of Fatima Preschool is a fun, inviting atmosphere that fosters learning and playing in a safe and loving environment. Children are encouraged to explore and engage in many activities that promote cognitive, social, and emotional development. Upon entering the classrooms, you will find happy, energetic children who are engaged by our highly experienced teachers. Classrooms are filled with hands-on activities that encourage the children to explore with a variety of learning materials that make the experiences meaningful to them. Our Pre K-3 Program is designed to enhance language and communication skills, and support cognitive, physical, social, and emotional development. Our staff will provide activities in literacy, language, science, social studies, math, art and music. Pre K-3 program is available five days a week and parents may choose a half day or full day program. Our Pre K-4 Program provides your student with independence and prepare him or her for the transition to kindergarten with a more organized environment. In the second semester, PK – 4 students begin making the preparation to enter kindergarten. Students begin attending weekly mass with the elementary school children. 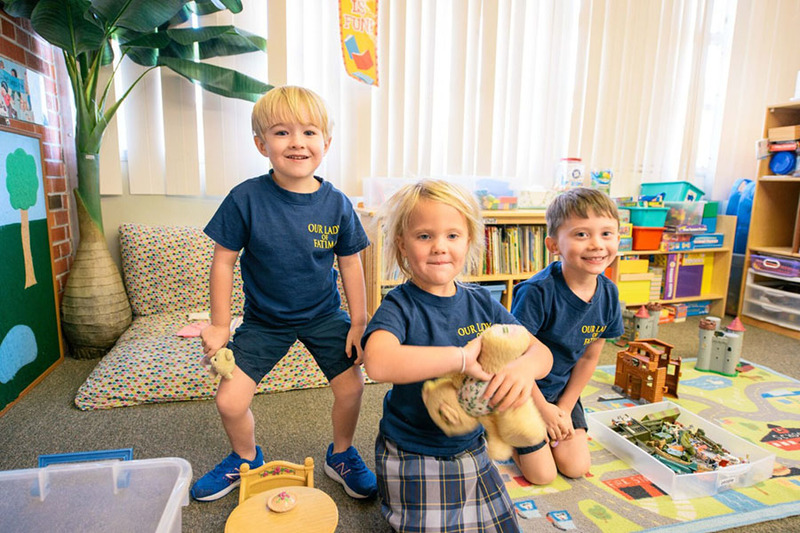 As the school year draws to a close, these students will spend time with the kindergarten class to help make the transition in the fall a successful one. Pre K-4 program is available five days a week.